Greetings and welcome to Empyrea! There are only a few items so I thought it would be nice to stray from our normal crafting to adventure in the new world. First off, these recipes are not for the faint of heart, none of these recipes are easy. The vendor is named Loligo, you can find him in Aerial Shore, Empyrea and he requires you to be a Visionary Crafter. Found her! Does that mean I get to take the rest of the day off? NO?! Aww mannn. Harvest Hannah is easy to find obviously, even I could do it. 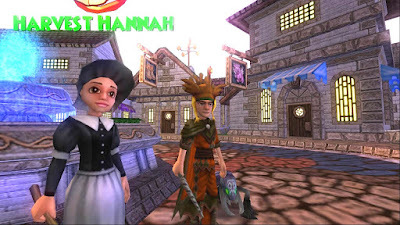 She is in the Shopping District of Wizard City, by the fountain heading towards Elik's Edge. What isn't so easy to find, however, is the stuff that she sells, without spending your hard earned crowns. But fear not, I have some handy tips for you. But Where is the Gardening? What is the hub bub about the new "revered" crafting level? Let me help you understand the new reagents, where to find them, and how to get them. Wanted: New Clothing Recipe Vendor Location? Those of you who have found your way to the test realm may be aware of the news! There has been an outcry from the wizarding community about the fact that we are way overdue for some new crafted gear. Our pleas have been heard - though this is not exactly what we may have had in mind, I am hopeful that it is a precursor for goodness to come. Nope. I'm actually not talking about the new level 120+ gear offered in Empyrea. I'm talking about level 50+ gear that offers healing properties. What?? I know, I know, you think I'm joking right? Unfortunately I didn't get a pic any of the Healer's gear. I had wanted to check out Empyrea and thought there would be plenty of time! But let me start at the beginning.